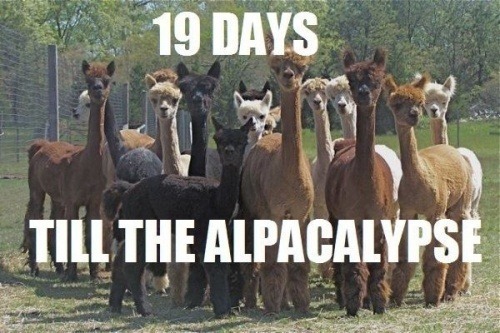 I guess we can start counting down till the alpacalypse with some fun number questions and stuff. It will take my mind off of the podcasts I am listening to about pole shifts and 2012 DA14 – that asteroid that will come perilously close to da erf in 2013 or whatever and junk. 14 is weird number to start on but it’s not like it really matters. It’s just a starting point and mostly I am counting down till the 20th because WHAT IF WE AREN’T HERE ON THE 21st? 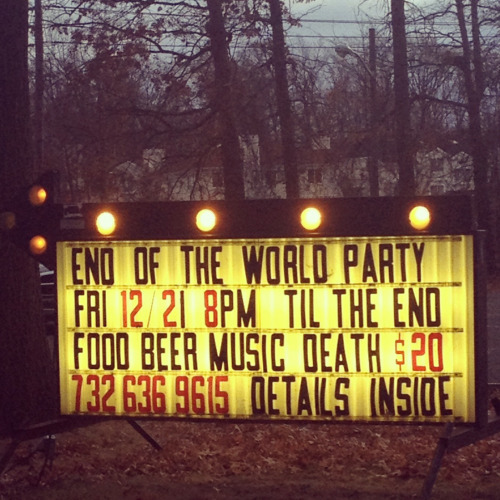 Also, IDEK that the 21st was a Friday so HOLY SHEET DUDES, PARTY CITY! There you go. That’s my list. I am probably forgetting stuff because I am prone to forgetting. Maybe if you all are with me in my bunker, we can barter and stuff. Now it is your turn. Think of as many items as you can. Go nuts. It’s not like it matters. IT’S 2012. Go! What items would you take into your underground bunker?